The potential volatile nature of high pressure oxygen it is extremely important to use the proper seal between the high pressure cylinder and the regulator. Don't be fooled into using aluminum washers! 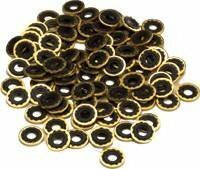 These deluxe brass-viton washers offer the safest the option for this sealing surface. It is recommended that you replace your washer every 6 months. Always inspect your regulator washer seal to make sure it is not damaged before use. The deluxe brass-viton washers offer the safest option for sealing surface. Recommended to replace your washer every 6 months. Inspect regulator washer seals to make sure it is not damaged before use. View More In Respiration Flow Meters.